But when Yates, back in his old job at the Pacific Journal, becomes obsessed by the disappearance of two aspiring Hollywood starlets, Nancy Hill and Julie Desjardins, he finds it leads him right back to his worst fear: legendary Mob boss Benjamin 'Bugsy' Siegel, a man he once crossed, and whose shadow he can't shake. 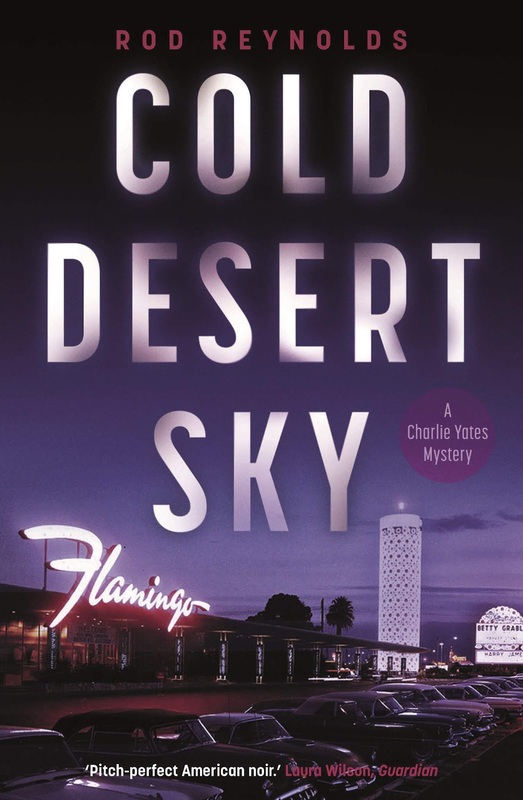 As events move from LA to the burgeoning Palace of Sin in the desert, Las Vegas - where Siegel is preparing to open his new Hotel Casino, The Flamingo - Rod Reynolds once again shows his skill at evoking time and place. With Charlie caught between the FBI and the mob, can he possibly see who is playing who, and find out what really happened to the two girls? I'd been meaning to read Rod Reynolds for a while, having heard great things about his modern-take-on-classic-US-noir tales from many people at crime writing festivals and events in the UK. I have a couple of books of his on my shelves, but ended up diving in first with this, his new tale that's the third in his series starring jaded post-war journalist Charlie Yates. I really shouldn't have waited. This is a great read, and I'll be immediately leaping the first two books up the TBR mountain range too. It's 1946, and the United States is adjusting to peacetime after the losses and deprivations of the Second World War. In Hollywood the studio system is still in full swing, and in Nevada a new type of casino hotel is being built in the desert a few miles outside of downtown Las Vegas. It's the early beginnings of what will become the infamous Las Vegas Strip, the Flamingo Hotel. And the man behind it is notorious mobster Benjamin 'Bugsy' Siegel. Charlie and his wife Lizzie are now in Los Angeles, trying to lay low, hiding in plain sight, particularly concerned about Siegel's attention. Unfortunately for the pair, Charlie becomes obsessed with investigating the disappearance of two aspiring actresses. It's a hunt with a murky motive. Charlie has something to prove, perhaps to himself, but why is he so zeroed in on these two particular girls? The search has him crossing paths with the mobster, and forced to become part of a shakedown scam against Hollywood bigwigs. As things get even more tangled, Charlie and Lizzie end up in a tenuous alliance with a rogue FBI agent and heading out to the desert to try and find some solutions to their overlapping problems. Reynolds may be a London-based author, but he's crafted a superbly evocative tale full of mid-20th century American hardboiled traditions - such as punchy dialogue, violent gangsters, shady law enforcement, noir sensibilities and an almost self-destructive yet honourable hero - while still coming across as fresh rather than any sort of mimicry. The influences are clear, but like a band who's found their own sound, Reynolds has a strong voice. The tale flows along really well. This is masculine, muscular crime storytelling set in a bygone era, but Reynolds also gives female characters plenty of depth and agency. Lizzie in particular is no mere hanger-on to her husband's heroics. And the missing girls are not mere McGuffins. The inclusion of real-life mobster Bugsy Siegel is an interesting choice, but works well. This is a really fascinating tale on many levels. Overall, Reynolds scratches at the American underbelly, skewering the glitz and fantasy that was like a veneer on that era and since, both in Hollywood and with what was to come in Las Vegas. Two cities built in or near deserts; it's unsurprising they're full of mirages. Recommended.